On Tuesday, July 25th Nikon Corporation will celebrate its 100th anniversary and whether you're a professional, enthusiast or an amateur photographer, Nikon has created the perfect way to celebrate this remarkable occasion. In celebration of its centenary, Nikon and Swarovski® (a registered trademark of Swarovski AG), one of the world's leading manufacturers of stunning crystals, have collaborated to create a beautiful and unique (one of a kind) crystal camera to be sold exclusively on the Nikon Store. In 1948, the Nikon Model I was released which was created using the most advanced optical technologies of its time and represented the starting point for Nikon cameras.,. 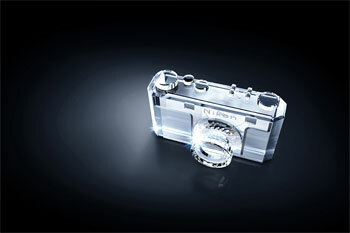 To commemorate Nikon's first camera and its 100th anniversary, Swarovski® has partnered with Nikon to create a beautiful, almost full-scale, crystal reproduction of the Nikon Model I. Precise attention to detail has been paid to this precious crystal replica. The corporate logo from 1948 can be found on the top of the reproduction, and even the applicable text has been engraved around the lens portion. Visit Nikon's 100th anniversary website for further details.